In 1997, in light of international developments with respect to asbestos, particularly after its banning in France and the ensuing controversy, the ministère de la Santé et des Services sociaux (MSSS) set up a Comité aviseur sur l'amiante (asbestos advisory committee). The aim of this committee was to make recommendations about appropriate measures to inform the public and to protect public health. The mandate of the Comité aviseur sur l'amiante (exposure measurement) consisted in assessing the pertinence and the feasibility of assessing asbestos exposure in the general population, particularly in public buildings such as schools. The sub-committee that was created to carry out this task first analyzed the available existing data from all areas. As early as June 1997, the sub-committee identified schools as priority action areas. The sub-committee developed a protocol and environmental assessment tools intended for all school boards and for the directions de santé publique (DSP—public health departments) concerned. The work was carried out in close collaboration with Quebec's ministère de l'Éducation (MEQ—ministry of education), the Commission de la santé et de la sécurité du travail (CSST—a workers' compensation board) and the Institut de recherché Robert-Sauvé en santé et en sécurité du travail (IRSST—Occupational Health and Safety Research Institute Robert-Sauvé) under the auspices of the ministère de la Santé et des Services sociaux (MSSS—ministry of health and social services). A program for the safe management of asbestos in schools was launched in the summer of 1997. A large part of the sub-committee's resources was mobilized for this program. In addition, resources were allocated to define a usable action criterion for managing the situation in the schools. 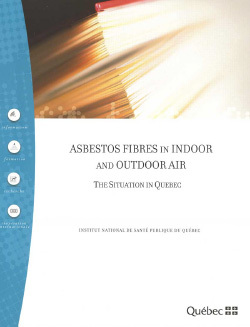 At the same time, work continued on other relevant aspects: the criteria and standards in effect in Quebec, the sampling of asbestos fibres in ambient air, the situation in workplaces such as mines and processing plants, and finally, exposure levels in mining towns and in ambient air in general. The present report sets out the committee's mandate on exposure measurement and the principal aspects of asbestos problems and issues at the environmental level. Then, it summarizes the current knowledge on population exposure in certain environments likely to contain asbestos fibres: public buildings, ambient air, and workplaces. Finally, it discusses the situation in Quebec. The committee then presents a series of recommendations to the MSSS with respect to this situation.